Wilhelm Schickard designed and constructed the first working mechanical calculator in 1623. In 1673, Gottfried Leibniz demonstrated a digital mechanical calculator, called the Stepped Reckoner. He may be considered the first computer scientist and information theorist, for, among other reasons, documenting the binary number system. In 1820, Thomas de Colmar launched the mechanical calculator industry[note 1] when he released his simplified arithmometer, which was the first calculating machine strong enough and reliable enough to be used daily in an office environment. Charles Babbage started the design of the first automatic mechanical calculator, his Difference Engine, in 1822, which eventually gave him the idea of the first programmable mechanical calculator, his Analytical Engine. He started developing this machine in 1834, and "in less than two years, he had sketched out many of the salient features of the modern computer". "A crucial step was the adoption of a punched card system derived from the Jacquard loom" making it infinitely programmable. 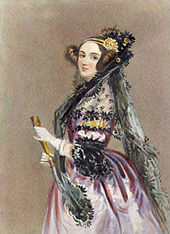 [note 2] In 1843, during the translation of a French article on the Analytical Engine, Ada Lovelace wrote, in one of the many notes she included, an algorithm to compute the Bernoulli numbers, which is considered to be the first computer program. Around 1885, Herman Hollerith invented the tabulator, which used punched cards to process statistical information; eventually his company became part of IBM. In 1937, one hundred years after Babbage's impossible dream, Howard Aiken convinced IBM, which was making all kinds of punched card equipment and was also in the calculator business to develop his giant programmable calculator, the ASCC/Harvard Mark I, based on Babbage's Analytical Engine, which itself used cards and a central computing unit. When the machine was finished, some hailed it as "Babbage's dream come true". During the 1940s, as new and more powerful computing machines were developed, the term computer came to refer to the machines rather than their human predecessors. As it became clear that computers could be used for more than just mathematical calculations, the field of computer science broadened to study computation in general. In 1945, IBM founded the Watson Scientific Computing Laboratory at Columbia University in New York City. The renovated fraternity house on Manhattan's West Side was IBM's first laboratory devoted to pure science. The lab is the forerunner of IBM's Research Division, which today operates research facilities around the world. Ultimately, the close relationship between IBM and the university was instrumental in the emergence of a new scientific discipline, with Columbia offering one of the first academic-credit courses in computer science in 1946. Computer science began to be established as a distinct academic discipline in the 1950s and early 1960s. The world's first computer science degree program, the Cambridge Diploma in Computer Science, began at the University of Cambridge Computer Laboratory in 1953. The first computer science degree program in the United States was formed at Purdue University in 1962. Since practical computers became available, many applications of computing have become distinct areas of study in their own rights. Although many initially believed it was impossible that computers themselves could actually be a scientific field of study, in the late fifties it gradually became accepted among the greater academic population. It is the now well-known IBM brand that formed part of the computer science revolution during this time. IBM (short for International Business Machines) released the IBM 704 and later the IBM 709 computers, which were widely used during the exploration period of such devices. "Still, working with the IBM [computer] was frustrating […] if you had misplaced as much as one letter in one instruction, the program would crash, and you would have to start the whole process over again". During the late 1950s, the computer science discipline was very much in its developmental stages, and such issues were commonplace. Time has seen significant improvements in the usability and effectiveness of computing technology. Modern society has seen a significant shift in the users of computer technology, from usage only by experts and professionals, to a near-ubiquitous user base. Initially, computers were quite costly, and some degree of humanitarian aid was needed for efficient use—in part from professional computer operators. As computer adoption became more widespread and affordable, less human assistance was needed for common usage. Computer graphics and computer-generated imagery have become ubiquitous in modern entertainment, particularly in television, cinema, advertising, animation and video games. Even films that feature no explicit CGI are usually "filmed" now on digital cameras, or edited or post-processed using a digital video editor. Although first proposed in 1956, the term "computer science" appears in a 1959 article in Communications of the ACM, in which Louis Fein argues for the creation of a Graduate School in Computer Sciences analogous to the creation of Harvard Business School in 1921, justifying the name by arguing that, like management science, the subject is applied and interdisciplinary in nature, while having the characteristics typical of an academic discipline. His efforts, and those of others such as numerical analyst George Forsythe, were rewarded: universities went on to create such programs, starting with Purdue in 1962. Despite its name, a significant amount of computer science does not involve the study of computers themselves. Because of this, several alternative names have been proposed. Certain departments of major universities prefer the term computing science, to emphasize precisely that difference. Danish scientist Peter Naur suggested the term datalogy, to reflect the fact that the scientific discipline revolves around data and data treatment, while not necessarily involving computers. The first scientific institution to use the term was the Department of Datalogy at the University of Copenhagen, founded in 1969, with Peter Naur being the first professor in datalogy. The term is used mainly in the Scandinavian countries. An alternative term, also proposed by Naur, is data science; this is now used for a multi-disciplinary field of data analysis, including statistics and databases. A folkloric quotation, often attributed to—but almost certainly not first formulated by—Edsger Dijkstra, states that "computer science is no more about computers than astronomy is about telescopes. "[note 3] The design and deployment of computers and computer systems is generally considered the province of disciplines other than computer science. For example, the study of computer hardware is usually considered part of computer engineering, while the study of commercial computer systems and their deployment is often called information technology or information systems. However, there has been much cross-fertilization of ideas between the various computer-related disciplines. Computer science research also often intersects other disciplines, such as philosophy, cognitive science, linguistics, mathematics, physics, biology, statistics, and logic. A number of computer scientists have argued for the distinction of three separate paradigms in computer science. Peter Wegner argued that those paradigms are science, technology, and mathematics. Peter Denning's working group argued that they are theory, abstraction (modeling), and design. Amnon H. Eden described them as the "rationalist paradigm" (which treats computer science as a branch of mathematics, which is prevalent in theoretical computer science, and mainly employs deductive reasoning), the "technocratic paradigm" (which might be found in engineering approaches, most prominently in software engineering), and the "scientific paradigm" (which approaches computer-related artifacts from the empirical perspective of natural sciences, identifiable in some branches of artificial intelligence). As a discipline, computer science spans a range of topics from theoretical studies of algorithms and the limits of computation to the practical issues of implementing computing systems in hardware and software.CSAB, formerly called Computing Sciences Accreditation Board—which is made up of representatives of the Association for Computing Machinery (ACM), and the IEEE Computer Society (IEEE CS)—identifies four areas that it considers crucial to the discipline of computer science: theory of computation, algorithms and data structures, programming methodology and languages, and computer elements and architecture. In addition to these four areas, CSAB also identifies fields such as software engineering, artificial intelligence, computer networking and communication, database systems, parallel computation, distributed computation, human–computer interaction, computer graphics, operating systems, and numerical and symbolic computation as being important areas of computer science. According to Peter Denning, the fundamental question underlying computer science is, "What can be (efficiently) automated?" Theory of computation is focused on answering fundamental questions about what can be computed and what amount of resources are required to perform those computations. In an effort to answer the first question, computability theory examines which computational problems are solvable on various theoretical models of computation. The second question is addressed by computational complexity theory, which studies the time and space costs associated with different approaches to solving a multitude of computational problems. Information theory is related to the quantification of information. This was developed by Claude Shannon to find fundamental limits on signal processing operations such as compressing data and on reliably storing and communicating data. Coding theory is the study of the properties of codes (systems for converting information from one form to another) and their fitness for a specific application. Codes are used for data compression, cryptography, error detection and correction, and more recently also for network coding. Codes are studied for the purpose of designing efficient and reliable data transmission methods. Computer architecture, or digital computer organization, is the conceptual design and fundamental operational structure of a computer system. It focuses largely on the way by which the central processing unit performs internally and accesses addresses in memory. The field often involves disciplines of computer engineering and electrical engineering, selecting and interconnecting hardware components to create computers that meet functional, performance, and cost goals. Computer performance analysis is the study of work flowing through computers with the general goals of improving throughput, controlling response time, using resources efficiently, eliminating bottlenecks, and predicting performance under anticipated peak loads.Benchmarks provide a method of comparing the performance of various subsystems across different chip/system architectures. Many languages offer support for multiple paradigms, making the distinction more a matter of style than of technical capabilities. Conferences are important events for computer science research. During these conferences, researchers from the public and private sectors present their recent work and meet. Unlike in most other academic fields, in computer science, the prestige of conference papers is greater than that of journal publications. One proposed explanation for this is the quick development of this relatively new field requires rapid review and distribution of results, a task better handled by conferences than by journals. Computer Science, known by its near synonyms, Computing, Computer Studies, Information Technology (IT) and Information and Computing Technology (ICT), has been taught in UK schools since the days of batch processing, mark sensitive cards and paper tape but usually to a select few students. In 1981, the BBC produced a micro-computer and classroom network and Computer Studies became common for GCE O level students (11–16-year-old), and Computer Science to A level students. Its importance was recognised, and it became a compulsory part of the National Curriculum, for Key Stage 3 & 4. In September 2014 it became an entitlement for all 7,000,000 pupils over the age of 4. In the US, with 14,000 school districts deciding the curriculum, provision was fractured. According to a 2010 report by the Association for Computing Machinery (ACM) and Computer Science Teachers Association (CSTA), only 14 out of 50 states have adopted significant education standards for high school computer science. Israel, New Zealand, and South Korea have included computer science in their national secondary education curricula, and several others are following. In many countries, there is a significant gender gap in computer science education. In 2012, only 20 percent of computer science degrees in the United States were awarded to women. The gender gap is also a problem in other western countries. The gap is smaller, or nonexistent, in some parts of the world. In 2011, women earned half of the computer science degrees in Malaysia. In 2001, 55 percent of computer science graduates in Guyana were women. ^ See the entry "Computer science" on Wikiquote for the history of this quotation. ^ The word "anything" is written in quotation marks because there are things that computers cannot do. One example is: to answer the question if an arbitrary given computer program will eventually finish or run forever (the Halting problem). ^ "WordNet Search—3.1". Wordnetweb.princeton.edu. Retrieved May 14, 2012. ^ "Charles Babbage Institute: Who Was Charles Babbage?". cbi.umn.edu. Retrieved December 28, 2016. ^ "Ada Lovelace | Babbage Engine | Computer History Museum". www.computerhistory.org. Retrieved December 28, 2016. ^ "Wilhelm Schickard – Ein Computerpionier" (PDF) (in German). ^ Keates, Fiona (June 25, 2012). "A Brief History of Computing". The Repository. The Royal Society. ^ "Science Museum—Introduction to Babbage". Archived from the original on September 8, 2006. Retrieved September 24, 2006. ^ a b Anthony Hyman (1982). Charles Babbage, pioneer of the computer. ^ "A Selection and Adaptation From Ada's Notes found in Ada, The Enchantress of Numbers," by Betty Alexandra Toole Ed.D. Strawberry Press, Mill Valley, CA". Archived from the original on February 10, 2006. Retrieved May 4, 2006. ^ "IBM Archives: 1945". Ibm.com. Retrieved March 19, 2019. ^ "IBM100 – The Origins of Computer Science". Ibm.com. September 15, 1995. Retrieved March 19, 2019. ^ a b c Denning, Peter J. (2000). "Computer Science: The Discipline" (PDF). Encyclopedia of Computer Science. Archived from the original (PDF) on May 25, 2006. ^ "Some EDSAC statistics". University of Cambridge. Retrieved November 19, 2011. ^ "Computer science pioneer Samuel D. Conte dies at 85". Purdue Computer Science. July 1, 2002. Retrieved December 12, 2014. ^ a b Levy, Steven (1984). Hackers: Heroes of the Computer Revolution. Doubleday. ISBN 978-0-385-19195-1. ^ a b c d Tedre, Matti (2014). The Science of Computing: Shaping a Discipline. Taylor and Francis / CRC Press. ^ "IBM 704 Electronic Data Processing System—CHM Revolution". Computerhistory.org. Retrieved July 7, 2013. ^ "IBM 709: a powerful new data processing system" (PDF). Computer History Museum. Archived from the original (PDF) on March 4, 2016. Retrieved December 12, 2014. ^ "Timeline of Computer History". Computer History Museum. Retrieved November 24, 2015. ^ a b David Kahn, The Codebreakers, 1967, ISBN 0-684-83130-9. ^ a b "Computer Science : Achievements and Challenges circa 2000" (PDF). Archived from the original (PDF) on September 11, 2006. Retrieved January 11, 2007. ^ Constable, R.L. (March 2000). "Computer Science: Achievements and Challenges circa 2000" (PDF). ^ Abelson, H.; G.J. Sussman with J. Sussman (1996). Structure and Interpretation of Computer Programs (2nd ed.). MIT Press. ISBN 978-0-262-01153-2. The computer revolution is a revolution in the way we think and in the way we express what we think. The essence of this change is the emergence of what might best be called procedural epistemology – the study of the structure of knowledge from an imperative point of view, as opposed to the more declarative point of view taken by classical mathematical subjects. ^ "Black box traders are on the march". The Telegraph. August 26, 2006. Archived from the original on June 21, 2008. ^ Kirilenko, Andrei A.; Kyle, Albert S.; Samadi, Mehrdad; Tuzun, Tugkan (January 6, 2017). "The Impact of High Frequency Trading on an Electronic Market". Papers.ssrn.com. doi:10.2139/ssrn.1686004. SSRN 1686004. ^ Maly, Timy (January 30, 2013). "How Digital Filmmakers Produced a Gorgeous Sci-Fi Movie on a Kickstarter Budget". Wired. Retrieved November 24, 2015. ^ Matthau, Charles (January 8, 2015). "How Tech Has Shaped Film Making: The Film vs. Digital Debate Is Put to Rest". Wired. Retrieved November 24, 2015. ^ a b Louis Fine (1959). "The Role of the University in Computers, Data Processing, and Related Fields". Communications of the ACM. 2 (9): 7–14. doi:10.1145/368424.368427. ^ "Stanford University Oral History". Stanford University. Retrieved May 30, 2013. ^ Matti Tedre (2006). "The Development of Computer Science: A Sociocultural Perspective" (PDF). p. 260. Retrieved December 12, 2014. ^ Peter Naur (1966). "The science of datalogy". Communications of the ACM. 9 (7): 485. doi:10.1145/365719.366510. ^ Weiss, E.A. ; Corley, Henry P.T. "Communications of the ACM". Communications of the ACM. 1 (4): 6. doi:10.1145/368796.368802. ^ P. Mounier-Kuhn, L'Informatique en France, de la seconde guerre mondiale au Plan Calcul. L'émergence d'une science, Paris, PUPS, 2010, ch. 3 & 4. ^ Groth, Dennis P. (March 13, 2010). "Why an Informatics Degree? | February 2010 | Communications of the ACM". Cacm.acm.org. Retrieved March 19, 2019. ^ Tedre, M. (2011). "Computing as a Science: A Survey of Competing Viewpoints". Minds and Machines. 21 (3): 361–387. doi:10.1007/s11023-011-9240-4. ^ Parnas, D.L. (1998). "Software engineering programmes are not computer science programmes". Annals of Software Engineering. 6: 19–37. doi:10.1023/A:1018949113292. , p. 19: "Rather than treat software engineering as a subfield of computer science, I treat it as an element of the set, Civil Engineering, Mechanical Engineering, Chemical Engineering, Electrical Engineering, […]"
^ Wegner, P. (October 13–15, 1976). Research paradigms in computer science—Proceedings of the 2nd international Conference on Software Engineering. San Francisco, California, United States: IEEE Computer Society Press, Los Alamitos, CA. ^ Denning, P.J. ; Comer, D.E. ; Gries, D.; Mulder, M.C. ; Tucker, A.; Turner, A.J. ; Young, P.R. (January 1989). "Computing as a discipline". Communications of the ACM. 32: 9–23. doi:10.1145/63238.63239. ^ Eden, A.H. (2007). "Three Paradigms of Computer Science" (PDF). Minds and Machines. 17 (2): 135–167. CiteSeerX 10.1.1.304.7763. doi:10.1007/s11023-007-9060-8. Archived from the original (PDF) on February 15, 2016. ^ a b "Computer Science as a Profession". Computing Sciences Accreditation Board. May 28, 1997. Archived from the original on June 17, 2008. Retrieved May 23, 2010. ^ Committee on the Fundamentals of Computer Science: Challenges and Opportunities, National Research Council (2004). Computer Science: Reflections on the Field, Reflections from the Field. National Academies Press. ISBN 978-0-309-09301-9. ^ "CSAB Leading Computer Education". CSAB. August 3, 2011. Retrieved November 19, 2011. ^ P. Collins, Graham (October 14, 2002). "Claude E. Shannon: Founder of Information Theory". Scientific American. Retrieved December 12, 2014. ^ A. Thisted, Ronald (April 7, 1997). "Computer Architecture" (PDF). The University of Chicago. ^ Wescott, Bob (2013). The Every Computer Performance Book, Chapter 3: Useful laws. CreateSpace. ISBN 978-1-4826-5775-3. ^ Rapaport, William J. (September 20, 2013). "What Is Computation?". State University of New York at Buffalo. ^ "Multi-Paradigm Programming Language". developer.mozilla.org. Mozilla Foundation. Archived from the original on August 21, 2013. ^ Meyer, Bertrand (April 2009). "Viewpoint: Research evaluation for computer science". Communications of the ACM. 25 (4): 31–34. doi:10.1145/1498765.1498780. ^ Patterson, David (August 1999). "Evaluating Computer Scientists and Engineers For Promotion and Tenure". Computing Research Association. ^ Fortnow, Lance (August 2009). "Viewpoint: Time for Computer Science to Grow Up". Communications of the ACM. 52 (8): 33–35. doi:10.1145/1536616.1536631. ^ Burns, Judith (April 3, 2016). "Computer science A-level 1970s style". Retrieved February 9, 2019. ^ Jones, Michael (October 1915). "Developing a Computer Science Curriculum in England: Exploring Approaches in the USA" (PDF). Winston Churchill Memorial Trust. Retrieved February 9, 2019. ^ "Computer Science: Not Just an Elective Anymore". Education Week. February 25, 2014. ^ Wilson, Cameron; Sudol, Leigh Ann; Stephenson, Chris; Stehlik, Mark (2010). "Running on Empty: The Failure to Teach K–12 Computer Science in the Digital Age" (PDF). ACM. ^ "A is for algorithm". The Economist. April 26, 2014. ^ "Computing at School International comparisons" (PDF). Retrieved July 20, 2015. ^ "Adding Coding to the Curriculum". The New York Times. March 23, 2014. ^ "Percentage of Bachelor's degrees conferred to women, by major (1970–2012)". June 14, 2014. Retrieved July 20, 2015. ^ a b James, Justin. "IT gender gap: Where are the female programmers?". TechRepublic. ^ "what [sic!] gender is science" (PDF). Retrieved July 20, 2015.